On paper, the idea of mixing a traditional JRPG with a Harvest Moon-like farming simulation seems like a great idea. 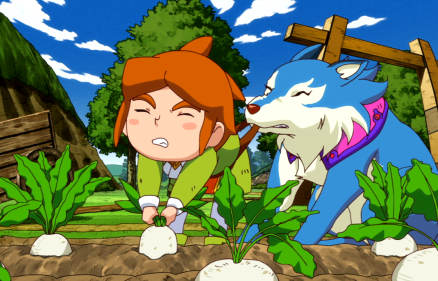 In execution, Return to PoPoLoCrois: A Story of Seasons Fairytale starts to come across as a series of half-measures that is still a good deal of fun and has a broad appeal, but perhaps not as deep in either genre as the experience could have been either. Few people enjoy the grind of a traditional JRPG more than me. However, I am not the biggest fan of Harvest Moon, Rune Factory, or other games that make farming a core component. In a sense, I suspect this game was made for people just like me, serving as a lightweight introduction to the latter while still letting me run around the land killing creatures and earning experience. 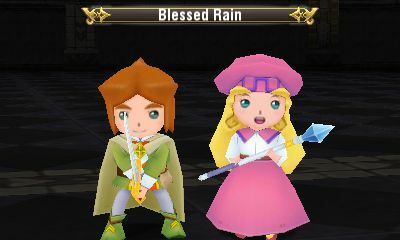 It does not help that Return to PoPoLoCrois: A Story of Seasons Fairytale gets off to a rather bland start once you get past the menus where you can pick your difficulty and adjust your encounter rates (both welcome options to be able to adjust). Our tale focuses on Pietro, a young prince who has already proven his bravery in the past in rescuing his kingdom once before with the help of his friends. Today is Pietro's thirteenth birthday, and he is excited to see his friends - one young woman in particular. The story does a nice job of touching on Pietro's youth as he acts awkwardly around young women, fumbling for the right things to say. At the same time, he ruffles the feathers of the king and his aide by constantly being out and about, gallivanting into trouble and simply being... well, a kid. I suspect that the age of thirteen was also not an accident, because over the course of Pietro's journeys, the older child starts to shoulder more and more responsibility as he tries to become a young man. Too often however, the narrative remains very thin and the characters by and large uninteresting. The JRPG elements work well, while seldom doing anything particularly new or interesting, but simply delivering solid, familiar results. The best aspect is combat, where the characters move about on the battlefield and mix in ranged and melee attacks that allow obstacles on the battlefield and line-of-sight to become very important. For example, you might have a skill that extends outward in a straight line, doing damage to a creature or creatures, so it is in your best interests to line up as many enemies as you can. Other skills might require that you be in close, but has a cone-like blast of damage if you do. Again, nothing revolutionary, which is a theme for this title, but it is a good system that I enjoyed most of the time. The turn-based combat is comfortable and fluid while paying out the usual rewards of money and experience for growing your characters and better equipping them. 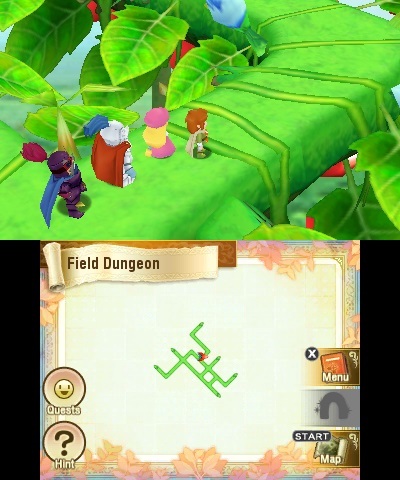 The map at the bottom of the screen is something we have seen on the Nintendo 3DS before, but I never get tired of that implementation. It is so handy to have the quick visual reference without the need to dive into a pause screen. There are also some nice touch buttons down there, such as a hint one, to help keep you moving in the proper direction. The simulation aspects are entertaining at first, but not as deep as titles that focus the entire game on them. Building relationships with other people is always welcome in a game like this, and the raising of crops and catching of bugs is superficially entertaining, but like the JRPG elements nothing really new is brought to the table. It is the inclusion of this element in a JRPG title that is fresh, but it would have been nice to see the two halves delve deeper into their respective genres and take a few more chances along the way. It is all a good start, something of a solid tease, but by and large it does not go anywhere. The visuals, music and voices are reflective of the overall package as well. They are bright, cheerful and generally enjoyable, but at the end of the day none of it comes away as particularly memorable. Pietro's interactions with other characters are the most interesting thing about him, but his adventure as it scales from birthday party, to a mystery involving dark beasts that are corrupting the land and see Pietro undertaking a grand journey despite his relatively tender age never really clicked. The narrative, like the overall systems at play would have probably benefited from a few more zigs and zags because the majority of what came to pass was pretty predictable. Exploration is a genuine joy here, because the landscapes are so colourfully realised and there is a really solid variety of places your characters get to go. I am one of those people who purposely tries to explore dead ends in mazes and just in general when exploring the environments in hope of finding something unique along the way. There were a good number of times that Return to PoPoLoCrois: A Story of Seasons Fairytale rewarded my curiosity with treasure chests. To that end this game really reminded me of the old school RPGs I grew up on. Return to PoPoLoCrois: A Story of Seasons Fairytale is a fun game, do not get me wrong. I believe that the developers wanted to craft something that might not have many unique features or systems on its own, but something different due to the blending of genres. It works, and the game is accessible and will likely appeal to a broader audience as a result. The problem I have is that Return to PoPoLoCrois: A Story of Seasons Fairytale starts to feel shallow. There are better farming simulations and JRPGs on the Nintendo 3DS. I generally enjoyed my time exploring, harvesting and killing things, but I could not escape the feeling that I had done this all before, and that there were better individual examples of each genre out there for the system.